GM9560 Bus Tie Mains Parallel Unit has multiple running states when it is parallel with mains: Genset output fixed active power and fixed reactive power; Mains peak lopping; Provide fixed power to mains; Load takeover; No-break return to mains supply. The powerful 32-bit Microprocessor contained within the unit allows for precision parameters measuring, fixed value adjustment, time setting and set value adjusting and etc..Majority parameters can be configured from front panel, and all parameters can be configured by USB interface (or RS485) to adjust via PC. It can be widely used in all types of automatic genset parallel system with compact structure, simple connections and high reliability. ♦Collects and shows 3-phase voltage and frequency of Bus1/Bus2. 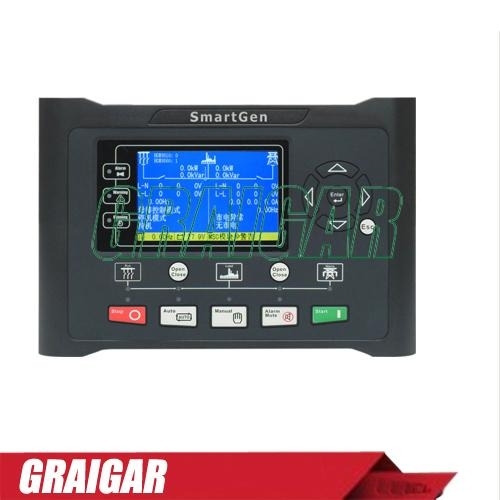 ♦Event log, real-time clock, scheduled start & stop generator (can be set as start genset once a day/week/month whether with load or not);. ♦Accumulative total electric energy A and B. Users can reset it as 0 and re-accumulative the value which make convenience to users to count the total value as their wish. The leakage current is not more than 3mA within 1min.